This entry is large, grand and beautifully designed. 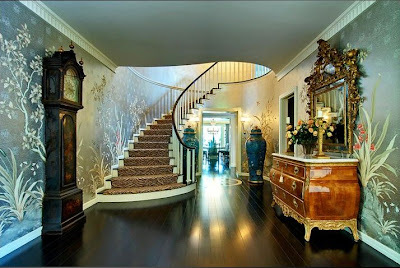 While the focal point is on the elegant winding staircase, notice how the hall credenza with overhead tall mirror to ceiling seems to anchor the room. The grandfather clock angled across the stairs to the urn in the right of the picture lends symmetry. Light and shadows also play into the overall ambiance of the space. What draws your eye?